1 What Is The Best AR 15 Scope to Buy? What Is The Best AR 15 Scope to Buy? Here is what the Best AR 15 Scopes can do for you. A good scope will let you engage targets at further distances, with tighter shot groupings, and throw more lead downrange, where it counts. With all the variety between scopes on the market it can be a daunting task trying to figure out which one to mount on your AR. The interactive chart of scopes below and the analysis that follows will help you decide what the best AR 15 scopes is for you. We’ve gone and compiled all the information you need to make the most informed decision. There are plenty of opinions online referencing scopes that are good for different situations; either for hunting, target practice, or even for self defense. But what matters most is finding the best AR 15 scope that fits your particular needs, so we’re here to help. I’m going to try to get right to the point with this. I was in a pinch, and I couldn’t afford a new scope that cost over $200, due to rent, bills, and all that other boring adult stuff… Although that sounds like a lot of money to spend, in the world of rifle scopes, it’s actually a pretty limited budget. I had to begin to look into other brands that I had never used before, and one of the ones that I ran across in my search was Nikon. Even with their very affordable products, they are still one of the leading companies in the world of sport optics and are known globally for their high quality products. They are constantly innovating their products which include binoculars, field scopes, and riflescopes. Nikon had a complete range of AR riflescopes which are specially engineered to fit perfectly on virtually any AR rifle. Each scope is optimized for Spot-On Ballistic Match Technology, which enables pinpoint precision no matter what caliber or load. Knowing all this, I figured I wasn’t taking much of a chance spending $150 on a Nikon scope, specifically the Nikon Matte BDC Carbine. This scope features fully multicoated optics that provide up to 98% light transmission in order to maximize sight from dawn to dusk. While using this BDC Carbine, I have never had an issue seeing through the sight; the optics are always incredibly clear, even at long distances. My eyesight is terrible so this scope really helps out with identifying my target, even at distances over 200 yards with the 3x magnification. I have consistently been able to hit a 1.5 inch target at 450 yards, using the BDC reticle with absolutely no problems. 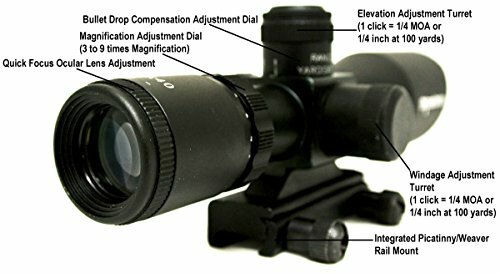 You will see a difference between this scope and the cheaper scopes in terms of clarity for this one is well above average for this price range, using glass instead of any other cheap materials. Continuing on that, the over-all quality of this scope seems to be far above average, using high quality material all around and being well built and designed. Even though it is lightweight and compact, you don’t get that typical “cheap” feeling you would usually get with light scopes. In the beginning when I first zeroed it in, I realized this scope offers zero-reset turrets and positive click reticle adjustments which helped me zero it and even quicker than usual. This also helps the scope remain at zero even after a few hundred rounds, avoiding common adjustments which brings complications. I started off zeroing it in at 50 yards and easily hit my target time after time with no issues whatsoever. It was really easy to aim with both eyes open at 50 yards or closer which is something that has always been challenging for me; this allows me to make quick target acquisition. Even with only a 3x optic magnification, I have still been able to make difficult shots at far distances with ease. The turrets are very solid and well made. At first I worried about their size and being exposed, mostly from an aesthetics viewpoint, but in the end, neither was an issue for me. The viewfinder in this scope is very generous, giving plenty of eye relief. I have had no problems with hitting my face, even with the heavy recoil of an AR-15. This new BDC Carbon reticle also provides a 200 yard cross hair with hash marks at both 400 and 600 yards. You are able to see much further with this rifle scope and can, much easier, zero in on any target. One of the great features with this scope that you will only find with Nikon scopes is the BDC markings along with the Nikon Spot-on App. There really is some next generation technology integration with this. Once you download the Nikon Spot-On App on your phone, it is easy to improve your accuracy and understanding of all ballistics. The app works great with the scope which takes caliber, ammo type, weather conditions, range, etc. and gives you invaluable information that you would otherwise have no access to. Let’s say for example you are sighting in with a range of 75 yards, but want a 100, 150, or 200 yard zeroed, the app will give you the information needed to make that possible. Also, if you change the ammo you are using, the app will modify the range on the markings with new yardage. This app is really helpful once you get the hang of it, even though there is a little bit of a learning curve with it, it will all make sense eventually! This BDC Carbine is really at the top of the pack when compared to Nikon’s other precision optics for AR rifles, designed for extreme sighting and accuracy even at long ranges. Just one more thing that is really just the frosting on the cake, would be how this scope is waterproof and fogproof, due to being nitrogen filled and O-ring sealed. This make shooting in any conditions possible while still achieving the flawless, clear sight without any fogging. One thing that I usually do like in my scopes is colored illumination, which this scopes doesn’t provide. I guess at such a low, affordable price, some things must be sacrificed, but good thing for me it is such a small thing! Every extra feature on this scope makes up for the lack of illumination. The clear glass reticle, along with the advanced technology in the BDC markings and Nikon Spot-On app make up for anything you would want that is missing. I have never had one problem with the scope losing zero or with the quality of how it’s made or the design. I was iffy at first purchasing a scope that I believed to be lower end, but in reality, it turned out to be one of the better scopes I’ve ever owned and at the lowest price I’ve ever paid. I never would have thought this was going to become my favorite scope, but it surpassed all my expectations and outshined every other scope I own! This P223 is most comparable to the NcSTAR Mark III and Aim Sports Dual III as far as capabilities in a 32mm fixed magnification scope. The magnification is slightly less at 3x as opposed to 4x but the quality is way beyond either of them. When looking for a decent rifle scope for my AR-15, I usually won’t spend less than $100 dollars. In my knowledge, the less money you spend, the less quality you will receive. I happened to be in a crunch one day; long story short, I broke my scope in a freak hunting accident and didn’t have the funds to buy the quality scopes I usually buy so I decided to start bargain hunting, not wanting to miss out on anymore of hunting season! While searching, I stumbled across a brand of scopes by BSA that seemed to have pretty positive user feedback. One of the reasons why I had probably never heard of them before was probably because they are actually a British optics company, with factories in Birmingham, Coventry, Redditch, and Sheffield. Although BSA first began supplying the British military with weapons in the mid 1800’s, they didn’t officially form BSA Optics until 1996 when they began producing riflescopes, lasers, red dots, and other shooting accessories. Everyone who knows BSA, loves them not only for their affordable price, but also for the high quality products they produce. Once I realized how much of a following BSA had, I figured they must have quality products, or everyone would be bashing them instead of praising them. I also have a few friends in the military I was able to get in contact with that mentioned many troops use BSA tactical weapon scopes and have much success with them. After that, my mind was pretty much made up and I decided to give the BSA 4×32 Tactical Weapon Scope a try. Shortly after mounting my new scope on my AR-15 and firing a few rounds, I recognized how great of a choice I had made. Not only did it look fantastic on my rifle, but it was obvious that quality and accuracy were superb. This scope is incredibly clear and allows you to find your target accurately and quickly. When I went to zero the scope, it only took 3 rounds and continued to hold through over 300 rounds. It features pull up adjuster knobs which push back down to lock it in place. This made it a lot easier to zero in than some scopes. After taking this out a few different times, it’s obvious to me that I won’t have to worry about it losing zero very often. The eye relief is about 4 inches which was surprising for such a reasonably priced scope. I didn’t see any sort of a fish bowl affect until I was at least 4 inches away so I was very impressed with that. This Scope comes with ring mounts along with two separate mounts for either an SKS or an AR so that adds a little versatility. You don’t necessarily have to use either of these mounts but it’s still a nice addition if you do need either one. This Tactical Weapon scope is completely waterproof, fogproof, and schockproof, so that’s adds to the value of this scope. No matter what temperature it was, as low as 25 degrees up to 95 degrees, there was no effect on how well it worked. In the past I have experienced fog on the lenses and inside the housing when the temperature rapidly changes and there was nothing of that sort with this scope. This is a solid scope that is really built exceptionally well and can handle a lot of recoil. There is consistently good accuracy and also includes both windage and elevation adjustments. As stated before, the optics are very clear which is due to the fully multi-coated optics. It never goes out of focus so I always have a clear shot. Comparing this to a higher priced scope that I would usually use, this is one of the finest in terms of cost vs. performance values. One of the only downfalls for me would be that there is no illumination. I usually like to use either a red or green mil dot reticle in different circumstances and conditions but it’s really not that big of a deal; I’ll survive. Looking back at all the features of this scope, it really is great quality, especially for the price. I will remember BSA next time I need scope in a pinch and don’t have the money to splurge on an Acog or any other $500 plus scope. I guess there really is no point in spending hundreds of dollars on an expensive name brand scope when you can find all the necessary components in a scope that costs well under $100. There are the essential windage and elevation knobs, 4 inch eye relief, clear optics, fogproof, waterproof… I could go on but you get the point. Again, this BSA scope is great quality and well built, especially for the price! This scope ranks amongst the other 4x scopes we’ve reviewed like the NcSTAR Mark III and Aim Sports Dual III. It has a larger eye relief than those two and usually rates better online. UTG, who also goes by Leapers, seems to design all their products with the customer in mind. A good amount of UTG products are manufactured in the United States, primarily in Livonia, Michigan. Although UTG is completely American owned, they do have some work that is manufactured in Taiwan, but it is all owned by UTG. Every product that I have ever purchased from them for my AR-15 has been extremely high quality, and seemed to be designed with the customer in mind the whole way through; even though the price of the products suggest that there may have been shortcuts taken, there is no evidence of that in anything I have ever used made by UTG. Something else I love about this company and their products is that they are constantly making changes to their products based on customer reviews and suggestions, which proves that they always have the customer in mind when designing and producing their scopes. When I am looking into buying a new scope for my AR-15 rifle, I have specifications that I look for along with things that I know I don’t want in a scope. Of course the main reason for a scope is to have accurate alignment for your target, along with allowing for extremely precise estimates of the range to the target. I look for a scope that allows me to compensate for bullet drop and windage, which I found that this, UTG compact scope allows me to do very well. Just as an extra bonus for me, this particular scope is fog proof, rain proof, and thankfully for me, shockproof. Something else that I always make sure to look for in a scope is a clear lens. I don’t have the best eye sight in the world so a scope with a lens made out of a cheap material just complicates things for me. This UTG Bug Buster does wonders for me in terms of having the clearest lens on any scope I have ever owned. This particular scope has a 1 inch tube with an emerald coated lens, making everything crystal clear for me. In the few weeks that I have owned this scope, I have used it multiple times on my AR-15 rifle and I have not had one problem with it fogging up on me and I am still amazed at how clear this lens is! I originally bought this because I own the 5th gen Bug Buster and I really like that scope. I was hoping that this scope would have even more improvements than that one; not only did this scope meet my expectations on the improvements from the 5th gen, but it completely blew my expectations out of the water! If the last UTG scope that I bought didn’t already make me a customer for life, this one definitely did. This is a very solid, heavy scope that doesn’t wobble around on the gun. Overall, the quality of the material is very strong and durable. After knocking it around a few times, it seems to be holding up very well. Also, after putting over 120 rounds through the weapon, it still held at zero with absolutely no problem. It also has quick release knobs which are very convenient. There are windage adjustment knobs and elevation adjustment knobs so you can adjust the windage and elevation and lock that in place. There is also a hex screw on top and a lock screw on the bottom. The laser sight is quoted at 100 yards and that holds very true. There are illuminated, mil dot cross hairs that can either be red or green, depending on your surroundings so you can choose whichever color works best for you. The brightness of the illumination can also be adjusted depending on what time of day you are using it; this comes in handy when using the gun at long range around dusk or when it is completely dark out. The zero lockable and zero resettable turrets are something about this scope that I love as well. They have consistent ¼ MOA per click adjustment which is a positive, along with there being plenty of tactile and audible feedback. This scope also features an adjustable objective from 3 yards but can also be adjust in order to achieve a parallax-free view. This is also accurately marked for yardage. It’s nice to be able to range something and set the AO to that range and see it clearly without further adjustment, especially with front adjusting AO. As far as lens caps go, this one is a very solid rubber lens cap, although it is non-transparent so it needs to be popped up in order to use the scope, which is not that big of a deal. It is kind of tight, which some people don’t really love, but it assures that I don’t lose it so I am happy with it. All tools are included with this scope including the two batteries, and the rings were separately boxed and wrapped. The picatinny rings are QD and definitely not cheap; they’re extremely heavy duty. I have taken them off and they do continue to remain at zero. The eye relief on this scope has a very large field of view, ranging between a little over three inches to a bit over four inches, complete with a two inch sunshade. This makes it perfect for a quick acquisition. This is something about the scope that pleasantly surprised me, especially for such a cheap scope. There is a long eye relief on the scope that really helps to open up the eye field of view, enabling for a swift target acquisition. This is a really nice thing, especially for deer hunting, just in case one happens to pop up right in front of you. Looking back at every little aspect of this scope that I bought specifically for my AR-15, it really seems that this new UTG generation compact CQB scope is much more than I anticipated. Besides maybe one or two miniscule errors that aren’t even worth mentioning, UTG really designed a great scope here that is worth much more than the small price that is being asked for this. The scope actually seemed to be much higher quality, structurally and design wise, than a couple scopes that I have spent upwards of 500 dollars on and this is definitely much improved since the 5th gen bug buster. It is delivers similar performance to the Monstrum and Barska 3-9x scopes. Picking out a decent scope for my AR-15 at a decent price can be a challenge at times. It’s nice to have a change in scopes every once in a while, but the journey to find one that lives up to all my expectations can by a huge struggle. After a couple failed attempts at finding a satisfactory scope, I finally decided that I will never be happy with any scope other than a Barska scope because they have some of the Best AR 15 Scopes on the market. Barska’s whole product range is designed using the most up to date optical technology, letting any novice or professional enjoy hunting to the greatest capacity. Every optic released by Barska is manufactured to the highest specifications, by leading manufacturers. Many of their scopes are built with a variation in coating options, also built with high density, optical glass and prisms. Every new product line and scope that Barska comes out with is always designed by a professional team of experts whose only goal it to create new and innovative products. Customer service is an important part to any business I have never experienced more exceptional customer service than I have with Barska. The Barska Contour Riflescope that I got for my AR-15 has truly been a pleasant surprise for me. There are so many characteristics that I have found in this scope that I couldn’t find anywhere else for such a decent price. First of all, the 42 mm objective lens magnifies all the way from three to nine times and has a surprisingly long eye relief of 3.9 inches. I have had a lot of issues in the past with finding a scope with this much eye relief so this is a big bonus for me. I am able to hold my head back far enough so that I don’t get hit in the face when I fire my rifle while still being able to see clearly with absolutely no distortion or seeing a fish eye effect in the scope. Most high quality scopes that I have dealt with in the past have been very heavy and bulky, but with this Contour Riflescope, that is not the case. I have finally been able to find a compact, lightweight scope that is also structurally sound and built very well which helps to provide extremely precise accuracy, which is almost impossible to find in a scope this size. The entire scope is also completely fog-proof and water proof so even when you get stuck out in the rain or less than ideal weather conditions, your eyesight won’t be affected when using this scope. I know personally I have used this scope multiple times in pretty hard rainfall and I have experienced absolutely no problems with the waterproofing of this scope. As stated before, the quality of this Contour riflescope has surpassed all of my expectations and that did not change when it came to zeroing it in. I zeroed this scope in with my AR-15 rifle at 100 yards and as expected, it was way off to start. Thankfully, this was a quick and easy problem to adjust. In only 60 rounds, it was fully zeroed in and I was able to hit a three inch target over 90% of the time. While shooting these rounds, I was using a 6x or 9x zoom which proves the excellent quality of the zoom. Also, this scope stays at zero very well as I have not had to do any adjusting throughout any of my hunting excursions. Even when it is excessively windy, there is still no difficulty in hitting 3-5 inch groupings from 100 yards away! This scope has more range than most scopes in this price range so I would recommend this to anyone who can’t afford a more expensive scope but are not willing to give up necessary functions of a great scope. A little word of advice though; when ordering this scope, do not order any rings ahead of time! Even for the small price paid for this scope, the picatinny base rings come already mounted on. The rings use a screw on the side so that gives you the ability to take them on and off as desired. Just to be on the safe side, I recommend tightening the screws super tight just in case they loosen up while shooting, especially with a high caliber rifle. Along with the rings that come with this scope, you also get bonus scope caps which typically would not be included for such a miniscule price. One of the caps is clear and one is a shade of yellow. This contour riflescope features fully-coated optics along with illuminated reticles which allow for enhanced performance. The optics are incredibly clear and crisp, even in full zoom which is very uncommon for a scope in this price range. The crosshair illuminates in only red so you don’t get much options as for that, but at least it goes red! As a little bonus, you receive a cleaning cloth with the scope with definitely will come in handy. I would consider this a great scope when searching for a bargain deal because you get so much for your money! Nobody ever said you had to pay a fortune to get a scope that works great in all conditions. Whether it is rainy, foggy, sunny, or dusk, this scope works well in all conditions and is very versatile. This scope has a very wide range compared to other scopes for this price, although it does work best anywhere from 25 to 100 yards. I love the compact, lightweight quality of this scope which makes it easy to use in any circumstance. Overall, I couldn’t find many negative things in this scope that would affect anyone’s decision to want to use it. Great price, high quality, and very versatile; what else could you ask for? This scope best compares to the other 3-9x scopes that we’ve reviewed, the UTG 3-9×32 CQB and the Monstrum 3-9×40 Tactical. Out of the three this Barska has the largest objective lens, good for increase light, but also makes it the heaviest. All three have illuminated reticles so it’s a toss up there. Check out the other reviews to see where they stack. When I was looking into buying a new scope, I happened to have a smaller budget to mess around with than I usually do. So i started the search for the Best AR 15 Scopes. Typically, I would spend the two or three hundred dollars on a high quality scope that I know will be everything that I anticipate it to be. This time around, I had to really do some research to find a high quality scope that was in my price range, as I had less than $150 to work with. Amazon seems to be my go to place lately for finding great deals, so that’s where I began my hunt. After going through quite a few different scopes, I kept going back to this Monstrum Tactical Rifle Scope. Something about it stuck out to me and I knew that I had to give it a chance. The scope that I usually used on my AR-15 was broken and I was missing out on valuable hunting time! Monstrum Tactical is a newer company, founded in 2010, that specializes in tactical optics, gear, and shooting accessories. Since the beginning, their first mission has always been to provide equipment for any budget that remains to be reliable and high quality. Everything is backed by their guarantee, along with having a very committed customer service team. Just because their products are affordable, doesn’t mean that they didn’t go through extensive product development, an intensive design process, and quality controlled manufacturing. Monstrum Tactical is constantly collaborating with other suppliers, evaluating, improving, and making additions to their product lines. Nobody said that just because you’re newer to the industry makes you unreliable and incompetent. In just a few short years, Monstrum moved from being centered out of a garage, all the way to being a leading distributor of the industry. Just because the price is reasonable, doesn’t mean that quality has to suffer for it. In the case of this Tactical Rifle Scope, I had to believe all the rumors about how great it was and give it a try myself, ignoring the measly price that was being asked. And boy, am I glad that I took that leap of faith! Right out of the box I could tell the quality of the scope was superb, being right up there with previous scopes I have paid over three hundred dollars for. Once I finally had a chance to get it on my AR-15, I realized how easy the actual mounting of it was, and how tight it really stayed on there. Even after 400 rounds with a pretty high recoil gun, I couldn’t see any noticeable signs that it had moved. Along with this Tactical Scope, you receive batteries already installed for the illumination, along with extra batteries too! Little things like that are sometimes what makes the difference to me about whether I want to buy one product or another, so that was a big bonus for me. Adding some versatility to this scope, you are given the option to choose either a green or a red illuminated crosshair, while also having the choice to just have a black crosshair. This makes it easier to shoot in different conditions, like aiming for a deer in the grass, or shooting closer to dusk. The different colors really do make a huge difference to me and it can really help out when you’re least expecting! Not only are you given the extra options with the dial controlled illumination of the reticle, but it really did work great. After taking it out to the range with my AR-15 once or twice, I quickly realized how solid of a scope this really is. Everything worked very smoothly including the focus, reticle, windage, laser, elevation, and mount adjustments. When I went to the range, I took my scope to sight it in for the first time, and it surprisingly took me only three rounds! I found a real quick and easy way to zero it in this time around, thanks to some advice from a friend. I took one shot first, aiming for the bulls eye. Next, I adjusted the integrated red laser sight to shine right through the hole I made in the bulls eye. For the third shot I adjusted the Mil-Dot Reticle to line up perfectly with the Red Laser dot. The first two shots I took at 50 yards, and the last shot was at 100 yards which is where the 3x-9x magnification was really useful. I couldn’t believe that after only three shots I had my scope perfectly zeroed in! The combination on this scope of the Mil-Dot Reticle and the Integrated Red Laser sight is such a perfect recipe for both long and short range, to sight in your scope very quickly and it helps to save some ammo! Being one who doesn’t usually mess around with cheaply priced products, I was thoroughly surprised by the integrity, build, and structure of this scope. After being used to five hundred dollar scopes, I was prepared to be disappointed but I am happy to say that I am thrilled silly by this scope. It has every feature that I would want on any scope plus more bonus features like having both a Mil-Dot Reticle, along with having green and red illumination. This Tactical scopes was easy to mount on my AR-15 and it looks great on my rifle. No matter how many rounds I shot off, this scope never loosened and always stayed at zero with no problems. Finding this scope in my current budget was quite a pleasant surprise and I’m glad I gave it a chance because it is now my favorite, over some of my three hundred dollar scopes! For similar scopes check out the other 3-9x’s we reviewed, by Barska and UTG. When it comes to purchasing the Best AR 15 Scopes, one of the biggest factors I always look for is the durability and how long this scope will actually last me. I happen to be one of those people that are very rough and not too careful with things like this. I drop things; I run into trees… you get the gist. I don’t want to purchase something that will only last me a short period of time before I have to get another. Quality is key when I am looking into buying new scopes for my AR-15 rifle; when it comes to the UTG Compact Scope, this scope ranks 5 stars in my book for quality! The construction and durability of this scope is fantastic; the finish is really good and the build quality is nice like in their other scopes. As a little test to check the durability of this scope, I attached it to my AR-15, using the socket set to tighten down the mounts, and went to the shooting range. I fired over 100 rounds and checked how everything was holding up. I was extremely happy to find out that I had absolutely no loss of zero. Also, the tightening lugs on the mount were not any looser than they were when I tightened them with the socket set. The windage and elevation knobs work great. You don’t have to take off a knob or a cover and they lock at zero. One thing I noticed about the knobs is that they click very smooth most of the time. The focus wheel is a little stiff but very good at staying in focus, especially around 100 yards. The zoom wheel is 3x-12x and is also a little stiff but that is a good thing for me. Also no matter what zoom you are in, this scope always remains in great clarity. Along with the flawless clarity in this UTG compact scope, it is also able to achieve constant and accurate adjustments due to the zero locking and zero resetting feature of the target turrets. Continuing further than that, the side wheel adjustable turret offers parallax adjustment all the way from 10 yards to infinity. Like many other UTG scopes, this particular one features premium zero locking and zero resetting target turrets, giving you the most consistent and accurate adjustment. UTG offers a limited lifetime warranty on this product, proving that this is really meant to last. Unlike many companies in today’s time and age, UTG, also known as Leaper, is consistently listening to customers feedback, always updating their products to make them the best in the industry while still maintaining affordable prices for any price range. The flip up overs on the front and back are really nice but they come a little loose from factory. An easy fix for that miniscule problem that I have figured out is using some good quality electrical tape. All you need to do is place it on the inside of the cap and the flip up covers become very secure and you will have no problems with that. As I stated before, the optics and clarity on this scope are amazing. I personally love the feature on this scope where you can choose whether cross hairs illuminate in green or red, along with 34 other colors, depending on your personal preference, surroundings and the time of day. The new 36 color options are so you can flip through colors until you find the best one that works best for you. There is a new special circuit and housing, designed to help maintain completely uninterrupted illumination, even when there is heavy recoil. UTG is always designing their product with the consumer in mind. They know that many people have difficulties seeing specific colors and UTG wanted to make it as easy as possible for anyone to see. Not only that, but you can also keep the illumination off, using black cross hairs just in case the battery happens to die. Always having the illumination on can make you go through batteries really fast so it’s nice that you have the option to turn that feature completely off. Even more than that, this particular scope is also designed to help conserve battery power by shutting the illumination off after about an hour. This UTG scope really was designed for strength and durability, featuring the True Strength Platform and a 30-millimeter tube, confirming a flawless performance; along with this, it ensures a shockproof, fog proof and rain proof scope, making this an all-weather scope. It can’t be stated enough that the optics on this particular scope are superior to many other scopes that you will pay two or three times the price for. There are special multi emerald coated lenses, ensuring for scratches to be a very rare occurrence, along with an angled sunshade to maintain a flawless view with no glares. After thoroughly looking around before buying this, to get a “name brand” scope that comes with all the features that are included in this one, you would have to pay at least four or five hundred dollars to come even close to getting everything this one comes with. I have actually been more satisfied with this UTG scope on my AR-15 than I have been with multiple other scopes that I paid hundreds of dollars more for. Overall, this scope was a very pleasant surprise for me and there will be no doubt in my mind about buying a UTG scope. This great quality, Mark III Quick Release Tactical Scope is part of the Mark III Tactical series and was designed and made by NcStar. This reliable company has been around since 1997, offering scopes, mounts, and lasers, along with many other rifle accessories. Their mission has always been the same goal; to provide reasonably priced, high quality optics. They strive to come up with innovative designs using feedback from customers, along with maintaining great customer service. All optics built by Ncstar are built to the highest quality control standards and also all come with a lifetime satisfaction guarantee. NcStar optics are used in all different circumstances including novice marksmen, professional shooters, and even the armed forces; anyone can find something that works for their skill level. I originally bought this Mark III to use on my AR-15 rifle. The price was the first thing that stood out to me. Even though this is no Acog, you are provided with so many different features that you would typically have to pay hundreds of dollars extra for and that makes this just an amazing steal. NcStar is a great company who really does make high quality products and this is, by far, one of those great products. One of the nice little additions that comes with this scope, is an extra battery to power the illumination. You get a couple different options besides just the regular crosshair, including red and green illuminated crosshairs. The different color options for the crosshair is a great feature for this scope because it just makes it that much more versatile. This feature makes shooting in any type of circumstances easy. If your target is in the grass, or it is starting to hit dusk, you just have to use the red illumination and you can still shoot with ease. One of the nice things about this specific scope is that it is very easy to zero and always does return to zero every time. In the past, I have had some difficulties zeroing some of the other scopes that I have used and I have not had that problem with this Mark III scope. It only took about 30 rounds on my AR-15 to sight it at about 100 yards. I would personally recommend that you use this scope anywhere from 25 all the way to 100 yards. Using this scope at anything less than 25 yards or for close-in support, I would advise getting a HUD. The mil dot reticle can easily be used to estimate range, especially if you know the size of your target. The overall quality of this scope is very impressive. The sight is very crisp and clear, which is very useful for long range shots. I have had bad experiences in the past with scopes that are blurry or distorted and that is definitely not a problem that will be faced with this scope. Yes, this scope works extremely well, but even more than that, the construction of this scope is very solid, which is a great bonus. Even though everything works great, the eye relief was a bit shorter than anticipated. After speaking to multiple other people who own this scope, I have found out that I’m not the only person experiencing this problem. I did a bit of investigation and found out that it may have been my misunderstanding about what eye relief really is. In reality, eye relief is determined to be the point where it becomes blurry when you look through the glass. With this exact scope, it usually begins to get a fishbowl look around three inches. This is also where the eyepiece is fully covering the inner barrel. You still continue to have a full view of the objective lens though. There are plenty of aspects about this scope that are worthy of praise, but of course I must mention one of the minor downfalls of the Mark III, although it is a fixable issue. One problem I, along with many others, have experienced is that the reticle and the mount are crooked and not level. This is actually a pretty common problem that I’ve had to deal with before on NcStar scopes but fortunately, this is something that can be easily fixed because it’s only caused by the base being screwed on unevenly. The base is only being held on by 2, 3mm Allen screws which can easily be undone and re adjusted. Most of the time this solves the problem but if it doesn’t or you don’t want to screw around with it, NcStar has great customer service and a great warranty and they will deal with the issue for you. In the many years that I have been hunting, I have gone through scope after scope, trying to find one that I like the best. I am a very picky person who likes very specific characteristics in a scope and honestly, I never thought a scope at such a reasonable price would satisfy me in every area. This Mark III has a very solid structure that is very well built and well designed. I love the different colors of illuminated cross hairs along with the fact that it is easy to zero, (and stays at zero!) Of course there always has to be something that I would change, but all in all, I would buy this scope again and recommend it to anyone looking for a cheap scope that comes with everything you could want. The Mark III is comparable to the other 4x fixed scope we reviewed, the Dual III. They have pretty similar specs; both are 4x, 32mm, and have illuminated reticles. The weight and length are a wash, but the Dual III does have a slightly longer eye relief. Aim Sports Inc. is somewhat of a newer company in term of how long they’ve been in business for, which is only about five years. Aim was established in 2007, but did not actually start out by manufacturing their own products. It all began by doing private label production for other manufacturers that had already established their name in the industry. After being in that game for a short period of time, they had an overwhelming amount of requests from dealers, merchants and consumers for access to reasonably priced products that still maintained the great quality that they were known for. From then on, the rest is history; they succeeded where others would have failed, conquering great feats that many companies starting off typically fail to overcome. Like a knowledgeable company should, they based their business off of feedback by clients of the industry, conquering such a competitive market from the beginning. They were able to flourish while also maintaining their high quality products and constantly exceeding the customers, and their own, expectations. Always continuing to expand, they have moved on from only offering mounts and other accessories for firearms, all the way to including many products aimed to enhance guns, including scopes. Their wide variety of high quality products, along with their constant commitment to improving their products based on customer feedback has pushed Aim Sports ahead of everyone else to the front of the pack in the firearms industry. Being one of the most popular scopes by Aim Sports, the Aim Sports 4×32 Dual III scope is one of the most advanced, structurally designed scopes on the market. When I ordered the AIM Dual III for my AR-15 rifle, it came with an Allen wrench, two batteries, a lens cloth (that comes in really handy when you are out hunting and have a smudge on your land), and an instruction manual, which isn’t really instructions, it just goes over features and specifications. On the front end of the scope, there is a really nice Aim Sports Logo which looks really spiffy on the scope. Although that is just an aesthetics thing, it’s still a nice addition. This scope is completely constructed out of metal which you can tell is very well built and of the highest quality; it goes very nicely with my Bushmaster AR-15. The mounting knobs are fairly easy to work with, but come pretty loose, which isn’t that big of a deal, at least not to me. There is a side screw on the right side which gives you the ability to adjust for windage. In order to get to the battery compartment, which is what powers the illumination, there is an adjustment knob on the top that must be twisted to the left. This particular scope uses one of those small, round batteries that a watch usually uses. A nice add on to this scope is a sunshade above the lens. On the inside of the sunshade, there are threads to add on additional options like a kill flash or a lens protector. Especially for the low price you are paying for this scope, this is a very nice surprising addition. The best part about this scope, and probably the coolest, is the tri-color illuminated crosshair! You get to choose whether there is a green, red, or blue dot in the middle of your crosshair. But it gets even better; you also get to choose between three intensity settings, depending on your preference. It is all based on what suits you best, but there are better times to use one color versus another. For example, if you are shooting a target laying in the grass, you’re probably not going to want to use green, (common sense, kind of?) Around dusk, blue works the best for me, but any other time of day, green or red would usually be my first pick. Even when the illumination is not on, you can still see the crosshair, which is nice if your battery dies, (it only lasts about six hours.) The ONLY downfall of this feature is the illuminator only appears in the center of the crosshair. The crosshair on this particular scope is somewhat discreet so it helps to not distort any targets and you have a very clear field of view. Another plus is that the crosshair has hashes to help compensate for bullet drop. On top of the scope is an awesome fiber-optic dual witness, which comes installed with the red fiber tube, although you also get a yellow fiber tube as well. The front dot glows intense red, down to practically no light. This is one great feature in this “bargain” scope that you would typically need to pay extra for. Since there are so many great features on this scope, I have to be extremely critical to find anything to actually complain about; so here’s my bit of criticism: the eye relief on this scope is advertised to be 3.5 inches, although I found it to only be 2 ½ inches, which is not a huge downfall, but I was just expecting it to be as it was stated, so just a little heads up on that one. A length of only 6″ makes it one of the shorter scopes we’ve reviewed, and the specs are most comparable to the NcStar Mark III, another 4×32 scope. The only real flaws are pretty much aesthetics which only affects the overall look of the scope. None of this affects the actual usability of the scope, just pure look, and I can’t imagine too many men that are into hunting and guns, caring a massive amount about look above performance. The special features on this Aim Sports 4×32 Dual III, including the three choices for illumination which I still think is very impressive, were pleasantly surprising to me, especially for the mere price paid for this gun. Video Review – We scoured Youtube to find the best review of the scope. See what others think. A telescopic sight, or scope, is the essential tool that can upgrade the accuracy of your shots in everything from hunting, to target shooting, to self defense, using an AR-15. In all these cases the scope works to make getting your shots on target much easier than lining up your standard iron sights. Instead of having to line up the rear sight, front sight, and your target before firing, with a scope you simply have to line up the crosshairs and the target. It immediately takes out a third of the complexity of the aiming process. Add to that the fact that most scopes have magnification, causing the target to appear closer, meaning your shot placement becomes even more precise. So how does this all work? A series of lenses refract incoming light from the target which magnifies the image. Within this system is a reticle, or image pattern, that overlays on the image and provides an aiming point. When all this is mounted onto the rail of your AR, you should be good to go. There is a little bit of pre work that needs to be done with zeroing in the scope to a given distance, but after that it should be accurate. Above you will find an interactive comparison chart of many of the top AR 15 scopes on the market today. As you can see there are a number of metrics that make each scope unique in its own way. Below we have defined those metrics that we find to be the most important when comparing scopes. This includes magnification, objective diameter, eye relief, field of view, reticle, and weight. Each variable has its trade offs, but if you can find a good combination of these for the right price then you should feel confident in your choice. The magnification power of the scope denotes the factor by how much it enlarges the image. So a 4x power scope makes the image appear 4 times larger, or as if you were standing 4 times closer to the object. An 8x scope makes it 8 times larger. There are fixed magnification scopes, which have only one magnification setting, and also variable magnification scopes which can be adjusted to provide a range of magnifications. Tradeoffs exist between deciding on a low or high powered scope. The low powered won’t provide as good of image enlargement but is less susceptible to shaking. A higher magnification is affected more by shaking, has a smaller field of view, and can lead to a dimmer image, but it does allow for greater image enlargement. The diameter of the objective lens, the one opposite to the lens you look through, is an important metric because it determines how much light can be gathered to form an image. As scope magnification power is increased and decreases the field of view, the image becomes dimmer. To compensate for this a large diameter objective lens is used to gather as much light as possible. Although bigger may sound better with larger diameter objective lens, they start introducing the issue of higher costs, more weight, and higher mount height. Typical lens diameters run between 30-40mm, with 50mm being on the large side of the scale. Eye relief is defined as the distance the shooter must position their eye from the ocular lens in order to make the full field of view visible. The full field is when the image is vignetted, or un-obscured by the scope itself. Typical eye reliefs can range from 1 to 4 inches. This distance is important for two reasons. First, it protects the shooter from the recoil of the gun. If the eye is positioned too close to the scope it may be hit when the gun recoils backwards after firing. Field of View is measured as how many feet are visible through the scope from the left to right side of the image at a distance of 100 yards. A larger FOV is ideal because it allows the shooter to see as much of his target and surroundings as possible. As magnification is increased the FOV goes down, and as it is decreased, FOV goes up. A typical FOV for a 3x scope might have be around 30ft at 100 yards, comparable to a typical 9x which may be around 14 ft. It should be noted that a larger objective lens does not translate to a larger field of view. A reticle is the crosshair pattern or aiming point placed in the scope that is overlaid on the image and shows the guns position on the target. The most basic crosshair is a simple vertical and horizontal line that intersect at the center of the FOV, but there are many varieties of reticles. Reticles can be designed to have thicker line widths to make it easier to see in busy background images. They can have added mil-dots, or even be illuminated. When you’re carrying around your AR for a long period of time, the additional weight of a scope can definitely start to wear on you. The use of a sling can help with this but you’ll feel the difference after a long walk to your hunting stand. The weight of a scope typically ranges between 12oz to 20oz. The heavier ones are those with the larger lenses which are made from thick glass.